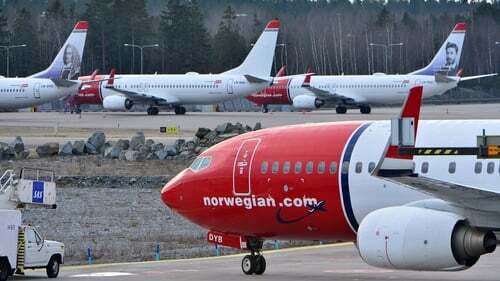 Norwegian Air has cut its expected capacity growth for 2019 to just 9% from 15-20% previously as it seeks to preserve cash and prioritise profits over growth. Europe's third-largest budget carrier by passenger numbers also reported a fourth-quarter loss today. The airline, which this week postponed 16 aircraft deliveries from Boeing and Airbus, raised its capacity by 37% in 2018 from 2017. "The key priority going forward is returning to profitability through a series of measures, including an extensive cost reduction programme, an optimised route portfolio and sale of aircraft," it said in a statement today. Norwegian Air's fourth-quarter result plunged to a loss of 3 billion Norwegian crowns ($351m) from a deficit of 713 million a year ago. The company had warned of a loss on January 29. When IAG, the parent company of Aer Lingus and British Airways, last month abandoned its attempt to buy the firm, Norwegian announced plans to raise cash from shareholders in the coming weeks.